Arvore de Vidas / e Genealogia / do muy Docto e Insigne H.H.R. 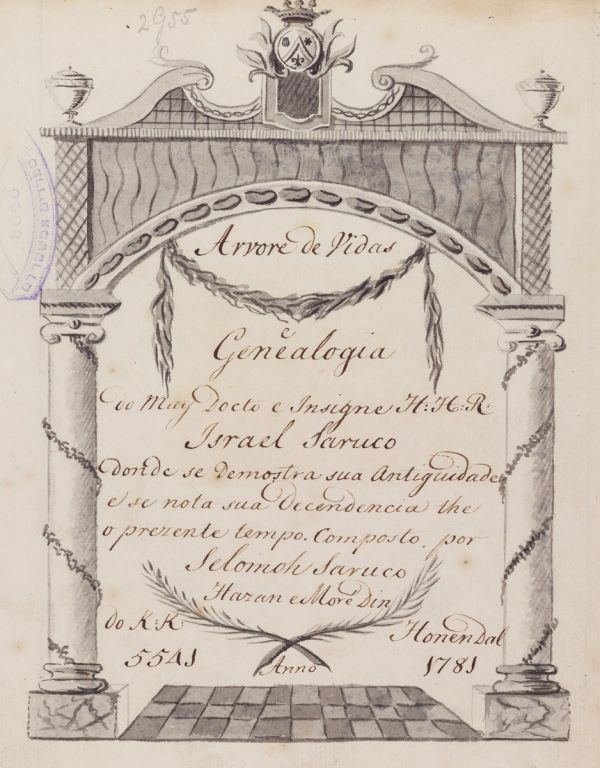 / Israel Saruco / donde se demostra sua Antiguidade / e se nota sua decendencia the / o prezente tempo composto por / Selomoh Saruco / Hazan e Moré din / do kk Honen Dal / 5541 anno 1781.
f. 1-22: Text with genealogical remarks about the Saruco family. f. 22r: Signature of Salomon Saruco with the seal of the family Arms. f. 22v: Subsequent annotations in Dutch with a last entry dated 15th August 1888. Presented to Ets Haim Library by Moses Henriques Pimentel of The Hague in 1902. Portuguese and Dutch / Paper / 2,11 x 17,4 cm. /  ff. (last 2 ll. blank) / 21 lines to a page / Current writing (autograph) / Signed and sealed at the end by the author / Title written in neatly drawn ornamental frame / Contemporary cardboard binding. Fuks 371. Fundação Calouste Gulbenkian.